Are eagles nesting too early this year? This is a still shot from the Minnesota DNR EagleCam, which is focused on a nest in Minneapolis. As you can see, there is already an eagle incubating eggs -- according to the website, there are 3 of them, laid around January 1st. 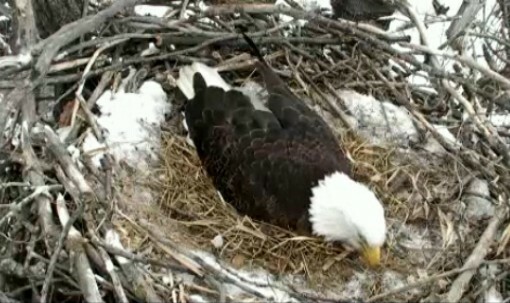 You can also see that the nest was full of snow, which the eagles have covered with straw. Given that the incubation period for a Bald Eagle is about 35 days, these eggs are long overdue to hatch -- if they ever do. January is awfully early for nesting here in Minnesota -- even now the lakes are still frozen, so it would be hard for eagles to catch fish (one of their favorite foods). They do eat carrion -- I have seen them on deer carcasses -- but would the chicks do OK on that? And what about getting chilled? Since those eggs were laid, it has gone below zero several times. I'll be watching this nest to see what happens. Eagles are not the only birds who might be mixed up by the crazy weather this year. There was a pair of mourning doves that apparently never migrated from here because of the long, snowless, unusually warm fall. Then it went to 20 below zero (F) one night and stayed below zero for several days. I have not seen the doves since. Did they freeze to death? And today I could swear I heard a robin -- no worms for it to eat yet. Maybe it will survive on frozen crab apples still on the trees. If climate change deniers would pay more attention to nature, it would become obvious that something is happening. A friend of mine in Pennsylvania said she has had pigeons breeding all winter, when normally they stop until spring. I read recently that birds in Europe are arriving 2-3 weeks early, long before the insects that they normally feed on have emerged. This certainly messes up the breeding season, since those birds evolved to feed their young on insects. Back here in Minnesota, we are getting a wildly fluctuating freeze-thaw-freeze-thaw, while most of our snow is going south. In spite of the fact that there's about a foot of the stuff in my yard, we are still technically in a drought, because there was so little rain last fall that the ground under that snow is very dry. And frozen, so when the snow does melt, it is just going to run off. According to the weatherman, this leaves us with the strange possibility of having drought and flooding at the same time.